Home › About Us › Congratulations to Stony Brook University’s 2018 iGEM team! 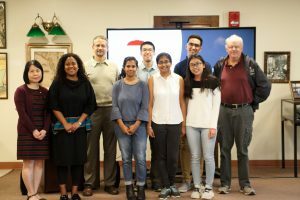 Congratulations to Stony Brook University’s 2018 iGEM team! The University Libraries congratulate Stony Brook University’s 2018 iGEM team on their gold medal win at the iGEM Giant Jamboree in Boston. This past September, the iGEM team presented their gold medal winning work (The Sucrose Factory: Engineering Cyanobacteria to Sink Carbon Dioxide by Producing Sucrose) in the University Libraries’ Special Collections Seminar Room.